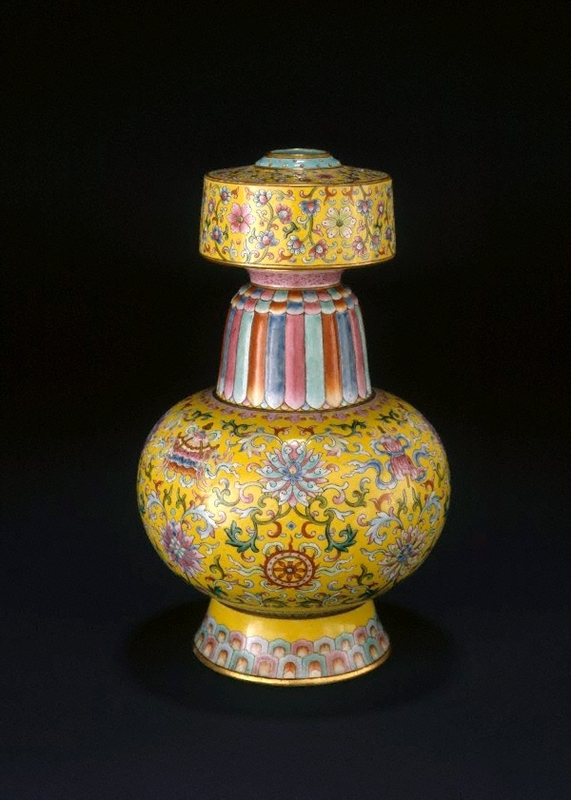 This skilfully modelled vase, with a shape inspired by Tibetan metal prototypes and a complexity of decoration typical of late Qing dynasty Imperial porcelain, was used on altars in the Imperial palace. The main decoration comprises eight lotus blooms and the eight Buddhist emblems of Happy Augury ('baji xiang'). The eight Buddhist emblems, popular motifs in Chinese decoration, are the canopy, the royal umbrella, the conch shell, the vase, the wheel of the law, the endless knot, the lotus flower and the pair of fish. 'Asian Art', AGNSW Collections, 1994, pg. 205. Jackie Menzies, AGNSW Collections , 'Asian Art - India, South-East Asia, China, Tibet, Korea, Japan', pg. 173-228, Sydney, 1994, 205 (colour illus. ).